During the winter holiday season, we celebrate all our loved ones, including our pets. 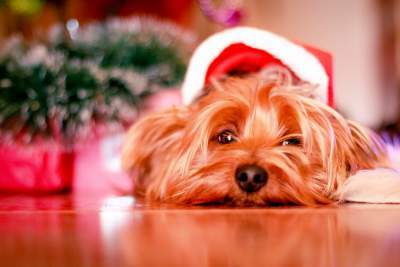 Pet safety during the holidays involves a lot of consideration when you pick your decorations. Keep your pets safe during the holidays by taking care with holiday plants dangerous to pets and decorations that can hurt your dog or other furry friends. String lights look amazing when lit on a wintery evening. But with more lights come more cords. Even if you have a way to organize your holiday electronic cords, they can pose a risk to pets who want to play with them. So, turn your holiday electronics off when you aren’t in the room — especially lights. Since a string of lights more or less consists of a long electrical cord, your furry friend can chew anywhere on it and get injured by the electrical shock. During our cold-weather celebrations, we love to decorate with plants like flowers and wreathes. Some pets like to express their appreciation of these plants by chewing on them, as pets are apt to do. So, what common holiday plants can hurt your beloved companion? Contrary to popular belief, poinsettias don’t pose a huge hazard to pets. They taste bad to cats and dogs, so they’re less likely to try to chew on them. And when pets do munch on a poinsettia plant, they usually only experience mild gastrointestinal symptoms. If you prefer to decorate with a natural Christmas tree, you don’t have to worry too much about it poisoning your pet, either. The sap causes minor symptoms when ingested. Just make sure your animal doesn’t run near the tree to avoid eye injury. However, just about any other holiday plant can seriously harm your furry friend if they try to eat it. Holly, mistletoe, lilies, daffodils and amaryllis can cause vomiting, tremors and more. If you decorate with any of these plants, keep them out of reach of your pet and monitor your little buddy for any unusual symptoms. Whether you light a menorah or use candles as Christmas decorations, you should take care when you do so. Curious pets can knock them down or get in contact with unsupervised candles, causing harm to them and you. Folks who use candles as a decoration can simply blow them out when they know nobody will be in the room. But if you celebrate Hanukkah, the menorah serves as an important symbol of what you celebrate. Some people use an electric menorah, but others also temporarily light a traditional menorah to honor the tradition of lighting it every night. Does Fido smell a little funky? Grooming your dog for the holiday season will get them ready to impress visitors. No need to book an appointment with a groomer — save time and money by using a self-serve pet wash!